Our webinar this week features a panel that will review recent HIPAA rule updates that create new requirements for law firms. If your firm provides services to the healthcare or insurance industry, or has practices that manage qualified protected health information, this session is for you. The 2013 HIPAA Omnibus Rule raises the stakes for law firms. Under the new regulations, firms that interact with protected health information (PHI) are directly liable for compliance with the entire HIPAA Security Rule and select provisions of the Privacy Rule. 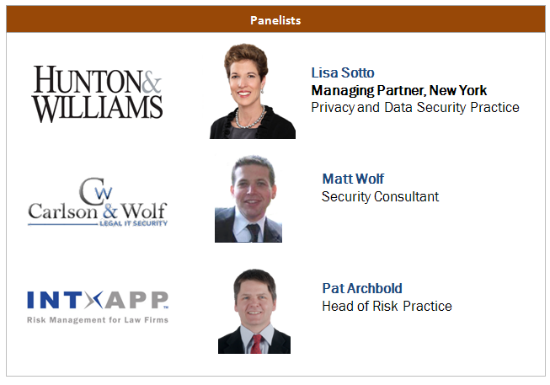 We're pleased to feature several speakers, including Lisa Sotto from Hunton & Williams, who has been rated as the #1 privacy expert for three consecutive years by Computerworld magazine.